Stu was a standout athlete at New Albany High School. He played fullback under Coach Alex Thom and was captain of the football team during his senior season, when he became the first NAHS student to ever to be named to the All-State football team. Wally Criswell, a long time sports writer for The New Albany Tribune, called him the greatest football player in school history. Stu didn’t let up on the pranks after getting married. One particularly memorable incident took place at Stu and Jo’s home in Georgetown on New Year’s Eve. Mary Lou had been out on a date that evening, and at the end of the night, she asked her date to drop her at Stu’s house. After graduating in 1943, Gibson joined the U.S. Army Air Corps. Stu and a number of classmates chose to sign up rather than get drafted, and Stu had enough credits to graduate early after the fall semester. He became a boxer during his time in the service, and he spent most of his time in the service traveling from base to base in boxing exhibitions. After leaving the service, Gibson returned home and enrolled at the University of Louisville. He joined the football team and quickly became a star at fullback for the Cardinals. Gibson was part of a group of players who transformed the program from a perennial loser into a powerhouse. The team went undefeated in 1947, Gibson’s final season, and Gibson led the team in scoring. Gibson’s exploits at the University of Louisville earned him the honorary title of Kentucky Colonel, a title he would use to full advantage in the coming years. Stu continued to box in college. He became good enough that in 1948 he earned a tryout for the U.S. Olympic team. Gibson was one of a number of men who trained with young Cassius Clay at the Columbia Gym in the same building where he would later become a wrestling star. For many years, Gibson joked that Clay, later Muhammed Ali, stole his “mean face” in the boxing ring from Gibson. As much as he loved boxing, Gibson knew he didn’t have much of a future in the sport. He was only 5’10” and his arms weren’t long enough to make him a serious contender. Football was an option as well, but there was much more money to be had at that time in wrestling. Wrestling was at the peak of its popularity in the early 1950s with the advent of television and colorful characters like Gorgeous George becoming household names, and top athletes like Gibson could actually make much more money in wrestling than they could in football. Alex Thom introduced Stu to his brother Billy, the wrestling coach at Indiana University and the head coach of the 1936 Olympic wrestling team. Billy Thom was also a professional wrestler himself, a former Middleweight Champion and a popular star in Louisville. Under Bill’s tutelage, Stu began his training to become a professional wrestler. 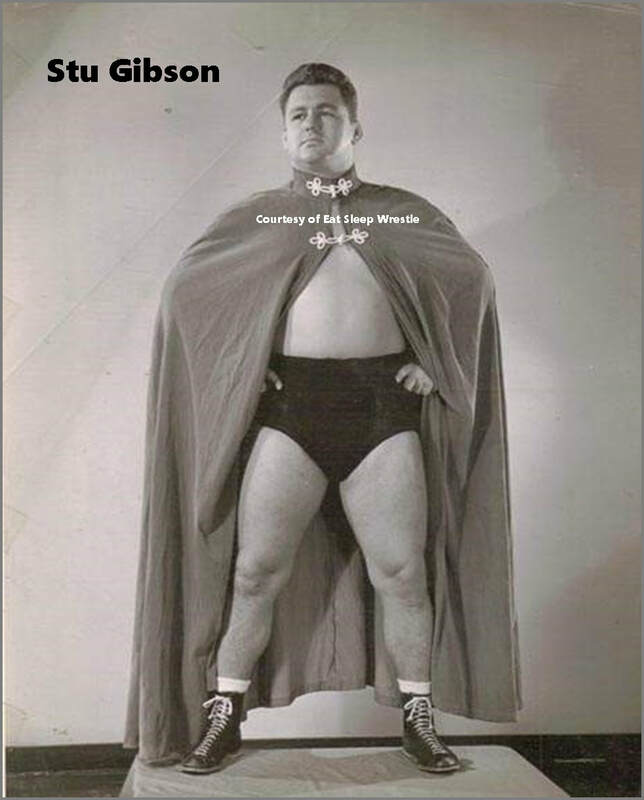 Gibson broke into the professional wrestling ranks in 1950 working for Francis McDonogh and the Allen Athletic Club in Louisville. Gibson was wildly popular with the Louisville fans and rose to become the top babyface (good guy) in the company. He caught the eye of former World Champion “Wild Bill” Longson, who took Gibson under his wing and brought him to St. Louis for further training and mentoring. Gibson may have started out as the good guy or “babyface” in wrestling parlance, but he truly came into his own when he became a villain, or “heel.” Gibson was a natural at drawing heat from the crowd, and the once beloved football hero quickly became the most hated man at the weekly wrestling shows. One of Gibson’s most memorable stunts at the weekly Louisville shows was when he threw a birthday bash for himself, inviting fans to bring gifts to show their appreciation. Most of the 1,550 were not eager to give Gibson any well wishes, but some actually did bring gifts, including a boar’s head, golf clubs, a color TV, cash, and a head of cabbage. As hated as Gibson was in Louisville, the heat was much more intense across the river in Jeffersonville, where Red Devil fans still remember how Gibson used to torment them in football. In 1952 during a wrestling program at Jeff’s Nachand Fieldhouse, a group of Jeff High students spotted Gibson’s Studebaker parked conveniently close to the marquee outside the main entrance. A freshman named Billy Tanner climbed up on the marquee and jumped straight down onto the roof of Stu’s car. The roof didn’t tear, but it caved in on impact. Tanner and the other boys hid in the parking lot and watched for Stu to come out of the building. Stu looked around briefly, looking very annoyed. He popped the hood back in place, and drove away while the boys hid and laughed. Gibson rose to main event status and took on all the top stars in the wrestling game, including Lou Thesz, Buddy Rogers, Antonio Rocca, Gorgeous George, Killer Kowalski, Vern Gagne, The Sheik, Enrique Torres, Don Leo Jonathan, Wilbur Snyder, Bull Curry, Pepper Gomez, Bobo Brazil, and Yvon Roberts. In 1957, after turning babyface, he had a memorable feud in Louisville with a masked wrestler known as the Zebra Kid. After several months of action, Gibson was able to unmask his foe, who turned out to be former Ohio State wrestling star George Bollas. Stu Gibson found similar success working for the San Antonio territory, where he was known as Col. Stu Gibson. The late sports writer and wrestling historian J Michael Kenyon recorded one of Gibson's most memorable stunts from the early 60s. "It was a small card at Victoria TX, where Gibson and Danny McShain hooked up in double count-out. It ended back in the corner of the building, on top of the concession stand, with Gibson spooning mustard into the semi-conscious form of McShain, amid veritable pandemonium. Stu lost a hair vs. hair match at one point in his career and had to shave his head. On another occasion in Louisville, he had his two front teeth knocked out. Actually, he had lost those teeth playing football in high school, but when his false teeth were knocked out in a match, he played it up and posed with a toothless grin for the Courier-Journal. The quick and agile in the ring, Gibson earned the nickname “Mr. Perpetual Motion” because of his constant action in the ring. He also earned the moniker “King of the Death Matches,” having successfully won a number of matches that can only end when one of the competitors is no longer able to continue the match. His signature moves included the pile-driver, the back breaker, and the “Kentucky Cannonball,” a maneuver in which Gibson jumps off the top rope into the middle of his opponent’s back. Gibson’s biggest year in the business was 1955, when he grossed $67,000, which equates to over $618,000 in 2018 dollars. The following year, he went on an undefeated streak that lasted 92 consecutive matches. He began to slow down in the late 1950s, settling down with his family in San Antonio. He knew he could not wrestle forever, but wrestling was in his blood, and he continued to work part time for many years. The Gibson family even has home video of Stu working in a battle royal with the Ninth Wonder of the World, Andre the Giant. Stu and Jo invested his wrestling earnings into real estate. They bought apartment buildings, which Jo managed, even getting her plumbing license. Stu also owned and operated a popular African American night club called The Clock. The club was located near an African American college in San Antonio, and the patrons loved Stu. Like many wrestlers, Stu had his share of bumps and bruises. He had chairs and lit cigarettes thrown at him during his days as a heel, and over time, his back started to go out. That said, the worst injury he ever sustained happened away from the ring. He was renovating a two story metal building when he fell off and broke both legs. Stu was in a wheelchair with a cast on each leg. On one of Stu’s visits home in the early 80s, he had a chance to get a little payback for an incident thirty years past. Billy Tanner, the freshman who had smashed in the roof of his Studebaker outside the Nachand Fieldhouse, told the story to a friend named Bill Heinz over lunch at the old Marriott Hotel in Clarksville. He had no idea that Heinz was, at the time, Stu’s brother-in-law. Heinz called Stu in San Antonio that afternoon and told him Tanner’s story. When Stu made his next visit to New Albany, Heinz arranged to have lunch with Tanner. Heinz and Gibson arrived early to wait for him. Six months after his diagnosis, Stu was gone. He passed away on March 30, 1988. He was survived by his parents, his four sisters, his wife, three sons, two daughters, and five grandchildren. He was only 62 years old. Author: John Cosper of Eat Sleep Wrestle.